Verizon's upcoming Droid X smartphone looks to be a multimedia behemoth, but the long-discussed device may end up drawing in business users as well. The Motorola Droid X, officially confirmed via Verizon's Web site on Thursday, has a 4.3-inch display, HDMI output, and the ability to capture 720-pixel video. 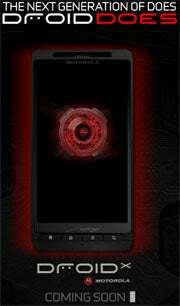 According to unofficially leaked info, the Droid X runs on a 1GHz processor with 8GB or 16GB of internal storage and an 8-megapixel camera. From a hardware perspective, then, the Droid X appears to be a solid contender amidst the other top-of-the-line smartphones. Computing power aside, though, the Droid X has other features that could give it fresh appeal for mobile workers. Verizon's Droid X, according to information published by gadget blog Engadget, is built for better typing: The phone, Engadget reports, comes preloaded with Swype -- a virtual typing utility that can dramatically improve on-screen keyboard efficiency -- as well as a new type of "multitouch keyboard" feature that could also allow for faster text input. If Motorola's CEO is right and corporations will increasingly begin issuing smartphones instead of notebooks to employees, productivity-boosting features like these could make a significant difference. Reports suggest Verizon's Droid X will ship with Android 2.2, the latest edition of Google's mobile operating system. So far, no existing devices have received the Android 2.2 upgrade, so the Droid X could very well be one of the first (if not the first) phone to officially run it. Previously, IT managers have told me they've hesitated to adopt Android because of the limited nature of its enterprise-oriented features. Android 2.2 works to correct this. The new OS steps up security with PIN-based lock-screens (both numeric and alphanumeric), lock-screen timeouts, and minimum password settings. It also adds the option for network administrators to remotely wipe users' phones, something crucial for corporations in case a device with sensitive data is misplaced. Security aside, the Android 2.2 software likely to ship on the Droid X offers auto-account-discovery and calendar sync for Exchange, as well as global address list look-up within the Android E-mail application. That'd mean users could search and autocomplete names from a company directory, as they would on their work PCs, without having to continually import or sync the personal contact lists on their phones. All of that said, Verizon's Droid X will have some serious competition within the enterprise market. Business-favorite RIM is working on a completely revamped version of its BlackBerry smartphone. While the device may struggle to spark widespread new consumer interest, it'll undoubtedly be an attractive upgrade option for businesses already committed to the BlackBerry platform. Apple's new iPhone 4, meanwhile, boasts numerous business-friendly features that are sure to catch some IT decision-makers' eyes. (My colleague Tony Bradley breaks down the good and bad of Apple's new iOS 4 from an enterprise perspective, if you're interested in seeing how it stacks up with other mobile OS options.) And even Microsoft, though not generally considered a major player in the smartphone realm these days, could see business-based success with its upcoming Windows Phone 7 line of phones. After all, most corporations are already using Microsoft's Office products on their in-house PCs, so it's not hard to imagine where a sale could be made. Within a matter of months, Motorola itself may end up giving the Droid X a tough business competitor, too: Moto's CEO, Sanjay Jha, recently discussed plans for a 2GHz Motorola Android smartphone. Jha said such a phone should become available before the year's end and suggested its processing potential could make it a natural fit for the growing world of mobile business. In the end, one thing's for sure: The race for the business mobile dollar is on, and the fight to come out on top will certainly be fierce. JR Raphael is a PCWorld contributing editor and the author of the new Android Power blog. You can find him on Facebook or at eSarcasm, his geek-humor getaway.